The Forum at Brookside is great and fits the needs of the people who live there. It's convenient and offers a lot of services. The staff is great and the services are plentiful. The food and dining room are great. My mom's room is very nice, clean, and homey. The Forum at Brookside was a very nice place. They have a lot of scheduled activities. It's built with a center which is very wide open and nice for group activities, and from that, there are areas going off of it for the apartments. They have a studio apartment which includes a full kitchen with a stove, refrigerator, microwave, and washer and dryer. It was an impressive place. We talked to one of the ladies who are there and she's completely happy with the food. The people I met were very nice. The rooms even have nice views and they have little balconies that are protected. They have windows that open into a common areas in the middle and it's one of these branches that went out, kind of like fingers. There's a grassy area between those fingers and walking areas and benches to sit down on. I am very pleased with The Forum. They are well staffed, knowledgeable, and friendly. They listen and take care of my mother’s needs. They do what the family articulates to them. It is a very nice facility that encourages the residents to socialize as far as they can. They have a lot of activities and encourage interaction. She is very limited as to what she can participate in, but there are a lot of activities for them. She had a birthday last week, and I inquired if family members can assemble and bring a cake and so on and so forth. They set up a room, decorated it with banners and had birthday activities. They are extremely accommodating and go above and beyond the call. It is a multi-level senior living facility. They have patio homes where people can live independently and just have maid service if they desire or go to a dining room and eat. They have about five different levels of care. It is a great facility. The Forum has everything. They have rehab, assisted living, and even independent living as well. They did not have any openings, but their reputation is stellar. The rooms were OK. I was impressed with The Forum at Brookside. They were probably the best facility that we have in the city. They had very nice rooms and apartments, but they were more costly than the other places. The dining room set up was very nice. They had group activities for people, and they provide transportation for the residents. The staff was very helpful. The Forum was wonderful. I couldn't find any negative thing about it. They seemed to be excellent. It was clean, well run, and secured, and the clients that we saw seemed to be driving and happy. We ate dinner there, and they were very gracious. My brother and his wife went with me, and we thought the apartments were nice. They had a lot of activities, and that was one of the good things that we were looking for. They had an indoor pool, and they had water aerobics. The Forum at Brookiside was very nice. It was larger, and the walking distance from the room to the dining room is what turned me off on that one; that was the only drawback. They do have a swimming pool, patio homes, a lot of acres, and a lot of land. My dad is in a facility in Louisville near my sister called The Forum. It’s clean, it feels like a home, it has excellent care, and the staff is very helpful. They have a garden area, and they can watch the ducks. They have a separate group that has an office but it is separate from the phone call helping hands, so we use that group a lot of times to make sure he gets to different place because his Alzheimer is getting worse. My sister has tried the food, and she has been very happy with the food. It’s in a really nice suburb area, and it’s kind of like a close gated community. There is a guard check when you come in, and then it sort of like a lot of woody grounds on paths that you can you on hiking. The Forum is 2 blocks from where I live. The staff is very wonderful. The food is good. They provide transportation, 3 meals a day. They have coupons so if my parents don't eat there one night, we can go another night and eat with them free. They have the largest floor space of any facility in Louisville on their apartments. The apartments are very nice-sized so they don't feel cramped. My parents love it. They're very happy. The rooms are extremely large. They're in an apartment but they also have villas. It's more like an apartment building than an institution. Their bathroom has safety bars and emergency cords. The activities are just wonderful. There is always something going on. The best features are the space, the rooms, the square footage of the apartments and the amenities. They have an indoor swimming pool. It's just very nice. The Forum at Brookside was recommended by Caring.com. I visited the place, since I was looking in the area for a facility for my mom. The staff were very nice to me. I liked the fact that there were independent homes and apartments. I saw both the rooms in the house and the apartments. The rooms were adequate, and definitely nice and clean. Although, I thought it needed to be updated. The dining room was very pretty; unfortunately, I was not able to sample the food. I thought a lot of the activities were centered around the meal times. The residents appeared content and happy. However, there was no progression in the event that her needs of care progressed. And that was one of the things I wanted available. Nonetheless, I really liked the independent apartment homes, and I would definitely recommend the facility to other people. The place is wonderful, as a matter of fact, it's everything I would ever want because of the way they do things and . The residents don't just sit in the wheelchair and I wouldn't want my mom just seated in the wheelchair. I like the way the staff treat the people that lived there. They have a section where they have people that can get around; an assisted living area, and then there is a section for dementia and Alzheimer's. The staff were more than helpful and more than caring. The staff that showed us around is very detail-oriented. They showed us around the facility and the activities they do on certain days a week. They have different room setups like a sewing room and for the men they have a tool room and a workshop room. We had breakfast there and the food was wonderful. The facility is clean. The whole place was just fresh, warm, and caring. They give one on one level of care. Depending on what your situation is they have specialist that worked with you on that particular group. The rooms have handicapped showers and handicapped bed. It's just so nice. The residents in the dementia unit were monitored. I felt comfortable with the staff. This facility has all facets of care from Independent Living to 24 hour Nursing Care. My only complaint is the level of service and follow through in the Nursing facility. Well meaning people, however, not up to date on the needed care of our patient. I like The Forum at Brookside very much. I will be moving there. It's very large, upscale, and nice. It looked absolutely lovely. It's on 40 acres. I'm going to be moving into a patio home, and they have a big apartment building as well. It's independent living, assisted living, and a nursing home, so you move from one stage to another. The food looked very good. They gave lunch to prospective people that was absolutely delicious and very upscale. The staff member was lovely and has been there for 12 years, the chef has been there for 11 years, and the manager just retired after 30 years. Everybody was very nice and very accommodating. My father loves The Forum at Brookside. It's perfect. His needs are met. His room is pretty and he feels very comfortable there. It's convenient. They have concerts, travelogues, classes like churches of the ancient world, a Derby Dinner group comes in and entertains them, pianists and cello players come in, there's bingo, book clubs, and pinochle. The food is delicious and he loves it. He's eating better there than he has in a while. It's a pretty facility. I lived at The Forum for almost four years now, and I really liked it here. I’m very pleased, it’s priced right, the food is outstanding, and the staff is really great. It has villas, apartments, and areas for nursing home and for assisted living. I have a studio apartment, everything is really great, they have tremendous service, and really good activities. We have an indoor swimming pool, and the price is all-in, but not many people know it, because it’s way off the highway. The property is probably 30 years old, but I wouldn’t live anywhere else; it’s perfect. The Forum at Brookside is a very pretty place, and the food was good. I visited one of their cottages, and the rooms are so small that I felt I had claustrophobia. They have almost everything, and they have church services in the facility and a lot of activities. This is a wonderful neighborhood of friendly, caring, people, both staff and residents are very kind to my wife who has no memory from her 9 year bout with Alzheimer's. I feel more comfortable here, than I would if she was in an Alzheimer's facility. We are leaning toward The Forum because they have continuing care, did not require an upfront deposit, and have separate cottages available. Aside from the usual activities, they have bridge and current affairs discussions. The Forum was a total community. They had a lot of trips for people. They had party room, and I thought it was good. It was the nicest facility prior to all that we saw. It was more wide open. The detriment was that a lot of their facilities were out of the main buildings -- a lot of condos. So in bad weather, that would be a problem in getting to the main facility. It was the only drawback to it. I ate there, and the food was really good. All the dining areas were separated by itself with four chairs and a table. They were very nicely done. It had a more community atmosphere than the others that we saw. The staff was extremely friendly and very helpful when you asked questions. I am the Executive Director and I sincerely appreciate your positive review. We are proud of our reputation as “Louisville’s Happiest Retirement Community” and we are pleased that you experienced our friendly atmosphere! Our park like setting on landscaped acreage has a neighborhood feel. We do offer townhomes which many residents select because of the privacy, the square footage, the easy access to their outdoor areas and the security of a gated campus. I want to be sure that you are aware of the services we provide to allow people to enjoy their private home setting and still be able to enjoy all of the services and amenities in our clubhouse building. During meal times, our bus will go through the neighborhood continuously so that our residents can easily enjoy meals in the dining room. Anytime during the day, just call us and we will pick you up at your door. We also provide meal delivery for those days that you may wish to stay in your townhome. Think of it as your own, personal chauffeur. The staff that showed us around The Forum at Brookside were all nice. It's a beautiful place -- a lot bigger than most -- but it costs a lot more there too. The rooms were really spacious. We didn't like the dining room because you have to go outside to get there. I think they need to have it where you don't have to go outside to get to it. For the most part of her stay my grandmother seemed to enjoy. The provided great meals and wonderful activities that keep other residents engaged daily, Most of her caregivers seemed to be helpful and caring. The only problem we seemed to have was getting feed and a good timing from the nurses, But overall I scored a 3 stars can no place can be 100 perfect. Features Extra: Library, Fitness Room/Gym, Lovely 40 Acre Campus, W/D In Apt. 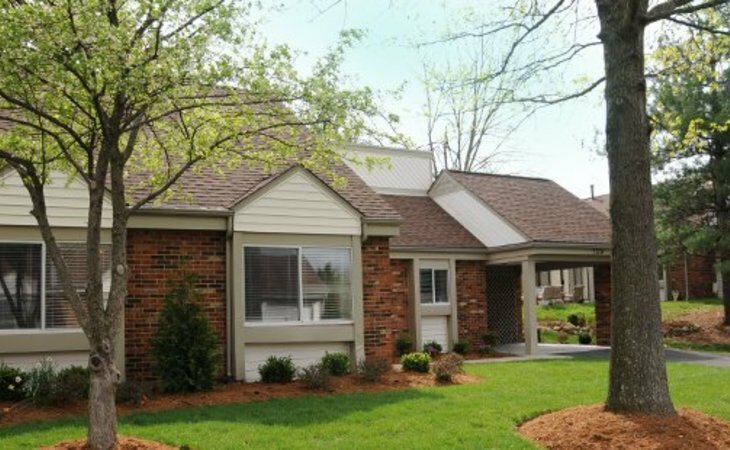 The Forum at Brookside offers compassionate senior care in Louisville, KY. We strive to create a home-like atmosphere where you and your loved ones can feel secure. Our warm, well-trained staff works closely with our residents to provide the utmost care and comfort. As part of the Five Star corporation, you can be sure that everyone at The Forum at Brookside shares the Five Star Values, and is committed to a high level of caring in all that they do. Please schedule a visit to see why we are the first choice in senior care in Louisville, KY.
What should caregivers and potential residents know about The Forum at Brookside?